The IT Time Bomb that Could Cost Your Business Money and Customers. Cynicism aside, he is correct. Every piece of equipment you use in your business is a time bomb, guaranteed to break at some point and need to be serviced or replaced. This includes your major IT infrastructure. 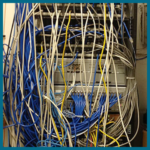 Since the Internet is the backbone of business today, IT equipment failure is a serious situation that needs to be fixed immediately.